Maybe Scarpa's F1 doesn't quite fit into the "ultralight" Alpine Touring ski boot category, but at just less than five and a half pounds per pair, it's very, very close. The genius of the F1 is that it brings Ski-Mo sensibilities to an everyman price—no $3000 carbon-inflated MSRP here. Simultaneously, the F1 does not demand you sacrifice what you love about downhill skiing. For the most part, it skis just like a regular A/T boot (albeit on the softer side). You may remember the F1 for its troubled debut. 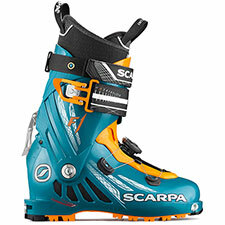 Originally, the F1 featured Scarpa's "Tronic" system, which flipped modes automatically depending on whether the boot heel was clicked into your tech binding. Reliability issues led to injuries which led to a recall. Today, the Tronic system appears only on the Euro version of the F1. American markets get a manual lever that engages or disengages walk. Much of what you need to know about the F1 can be summed up very simply: the F1 is good and almost great. I would go so far as to claim it is almost Scarpa's best boot, period. Climbing is, for the most part, simply a joy. With every step, you will notice the F1's diminished weight, and you will love it. Pair that with a fine and free walk mode, and putting a set of F1's on your feet will make you feel younger, stronger, and faster. Heck, probably better looking, too. In walk mode, the F1's forward range of motion seems a little restricted, compared to Scarpa's excellent Maestrale, but this works in the boot's favor when you flip to ski mode, as that extra resistance subjectively makes the forward flex feel a little stiffer than the Maestrale. The F1 has a boot-board insert that makes for a flat (by Scarpa standards) platform underfoot, allowing you to use a custom orthotic insert. For backcountry skiing I'm often fine with the manufacturer's inserts, but with the F1 I strongly recommend adding a custom footbed. Fit is an issue with this boot. Specifically, the F1 has a roomy interior and a weak buckle system. Really, there are no buckles—there are straps. OK, there is a strap-buckle. However you describe it, the F1 tends to pinch rather than envelop your foot, and even as tight as you can make it, the F1 struggles to lock down the foot (particularly the heel). To work properly, the Boa system requires careful examination to make sure a hidden interior part of the tongue/shell is in the right place relative to the liner. I would guess even if I tried to describe it, 50% or more of F1 users will still ride the boot with the liner improperly pinched. That said, it's worth it to try to get the alignment correct, because only then will the Boa system actually work (otherwise, it just pushes on the shell). Even so, the Boa system mostly just makes the forefoot tight without—crucially—driving your heel back. Oh, how the F1 needs the instep buckle of the Maestrale! Give the F1 the Maestrale's instep buckle, and you'd have a touring masterpiece. You cannot easily undo the F1's straps/boa/strap-buckle to restore blood flow to your feet, nor can you easily make fine adjustments as conditions warrant. There is no escaping it: Velcro straps are inherently slow and clumsy, not precise. This is a big loss, especially for long days and especially in challenging conditions. Remember your custom footbed? With this plus some strategic shimming, you should be able to improve the fit enough to somewhat mitigate the liabilities of the boot's no-buckle buckle system. And if you're using the F1 primarily for powder touring on skin tracks, the lack of proper buckles probably won't bother you in the least. Either way, I bet we will see a better buckle system in a future iteration, or perhaps a new boot which fuses the best of the F1 and the Maestrale. For now, I recommend you at least try the F1. Fit issues are notoriously variable depending on the individual; you may get a great out-of-the-box fit, in which case the F1 is going to seem like nothing less than a miracle. And even if the fit doesn't quite work for you, the F1 is so compelling you may still decide to use it, and just do your best to adapt to its quirks—as I have. Absolutely a boot to watch, and, when Scarpa gets this one dialed in, watch out!